THIS EVENT IS SOLD OUT. TICKETS WILL NOT BE SOLD AT THE DOOR. The Wild & Scenic Film Festival is one of the nation’s premiere environmental and adventure film festivals in North America being hosted in our own backyard. These international short films are a call to action! Soul-stirring stories and grand sweeping vistas give us a sense of place and what it means to be responsible stewards of the earth. They illustrate not only the challenges facing our planet but the work communities are doing to protect the environment and the places we love. They also portray the magnetic draw of nature and the adventurous side of the human spirit. Through a grant from National Sponsor, Patagonia, the Jupiter Inlet Lighthouse & Museum is proud to join over 150 communities around the globe, to increase a groundswell of environmental awareness and support through this festival. We invite you and your family to join us for our third annual festival featuring stunningly beautiful short films that make a big splash! 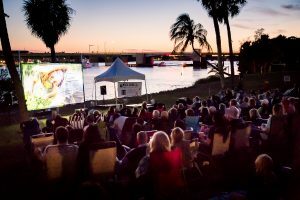 Films will be shown at the waterfront Lighthouse on the “big screen.” Food, sodas, beer & wine will be available for purchase. Live musical performance by the StratOlites. All proceeds support the Jupiter Inlet Lighthouse and Museum. Bring beach or lawn chairs. Outside food & drinks and pets not permitted. Gates open at 6:00 pm. Live & DJ Music 6:00-7:30. Presentation of the Outstanding Stewardship Award at 7:30 pm. Wild & Scenic Films begin after award presentation. Special discount is offered this evening only for new and renewing members of the Loxahatchee River Historical Society/Jupiter Inlet Lighthouse & Museum. National Sponsors: Patagonia, CLIF Bar, Sierra Nevada Brewing, Klean Kanteen, Barefoot Wine & Bubbly, Earth Justice, Orion Magazine and KEEN. Local Sponsors: 97.9 WRMF, 103.1 WIRK, Sunny 107.9, X 102.3, Beatz 96.3, 850WFTL, FoxSports 640AM, Bureau of Land Management, Florida Sugar Cane League, Discover The Palm Beaches, Palm Beach County, Cultural Council of Palm Beach County, Tidy Coast Event Services, Microwgraphics, Burrito Bros and BBQ, Whole Foods Market. The Loxahatchee River Historical Society operates and maintains the Jupiter Inlet Lighthouse & Museum and is a 501(c)3 nonprofit.